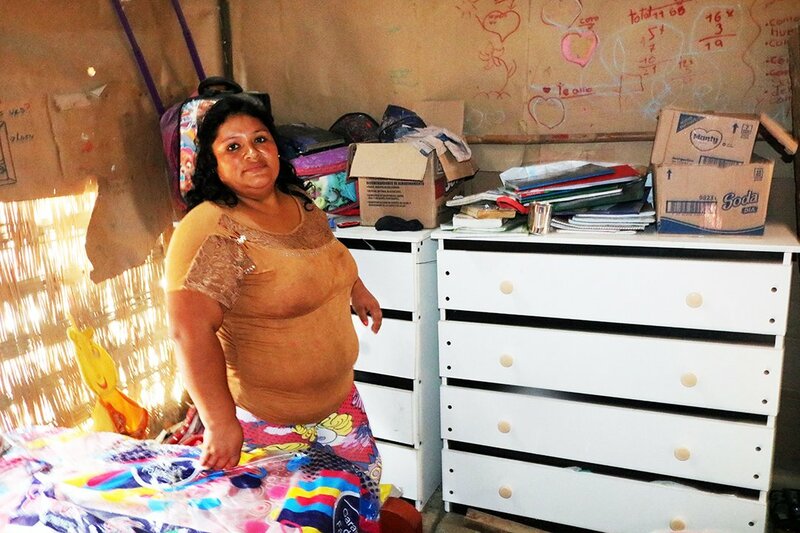 Magali Verguaray Capristano lives in Nuevo Chimbote with her three children ages 11, 9 and 6. Her humble home is constructed of recycled materials including woven reeds, cardboard and plastic sheets. Magali, her husband, and three children all shared one bed. They stored their clothing in rice bags and cooked their food over a wood fire in the home because they could not afford furniture or a stove. This is especially dangerous in homes made of woven reeds which are highly flammable. Magali worried constantly for the safety of her children. Five years ago, her husband passed away from brain cancer at the age of 33. 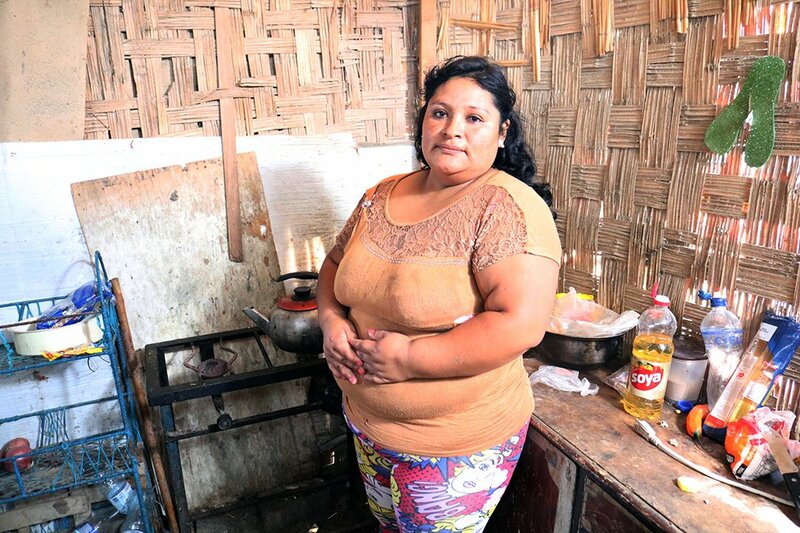 With little resources as a single mother, Magali found herself in a desperate situation working whatever job she could get to provide food for her children, although sometimes this was not enough. She sells food from her home at lunchtime, making an equivalent of $1-5 a day. When there is work in the fields, she also cuts sugarcane earning about $3 cutting 4,000 sugarcanes within six hours. She also washes clothes when that work is available. “Wherever the work is I go … I’d sacrifice anything for my kids,” she says. 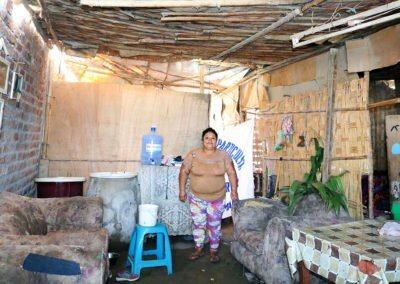 At one point, Magali considered leaving her children in Nuevo Chimbote to search for work in Lima, although this made her worry deeply for the safety and wellbeing of her children in a house that could be easily broken into. Last September, Magali learned about ACAF from a fellow parishioner at her church. In desperation for help, she reached out to ACAF asking for support. Seeing the lack of resources Magali possessed, how hard she worked, and her passion for doing whatever she could to provide basic needs for her children, ACAF stepped in to help. 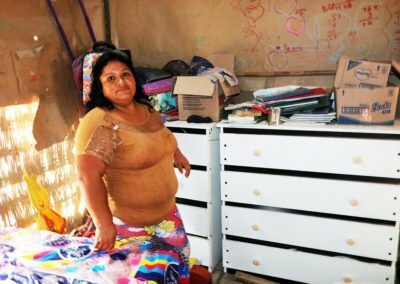 They provided two beds with mattresses, pillows, sheets and blankets so her two oldest children sleep in their own beds, while she sleeps with her youngest child. ACAF also provided a simple dining room kitchen with six chairs, a set of pots, a dresser, and some basic food staples. She continues to find work wherever she can and is saving money to one day construct a new roof for her home, which is currently made of woven reeds. During rains, the water seeps through and leaves the beds, blankets, furniture and her family wet. She dreams of a roof that creates a more safe and comfortable home for her children. Thanks to ACAF, Magali now feels more secure to stay with her children in Nuevo Chimbote. When asked how the help of ACAF made her feel, she eagerly replies, “Happy. Very happy.” She is grateful to God for the help she has received and shares a deep gratitude for those who have donated money to help people like her get back on their feet. 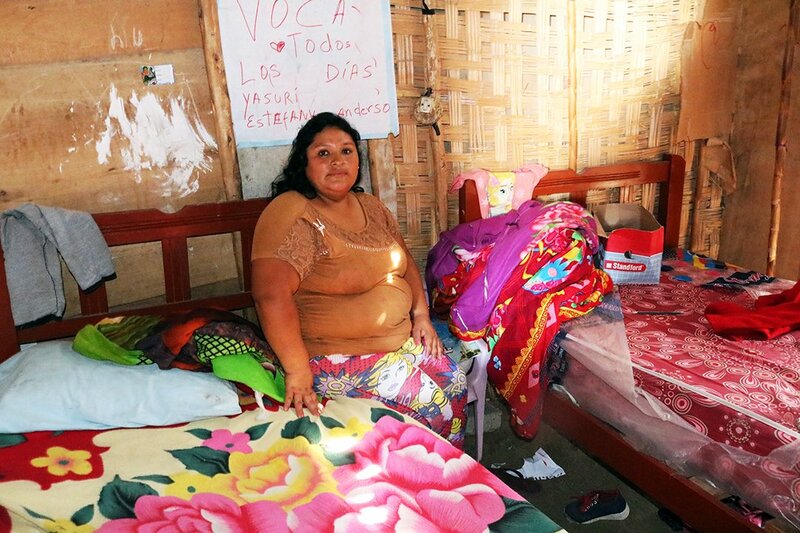 She cherishes the furniture and supplies from ACAF; her children sleep with the plastic wrap still around their beds and the table she was given is carefully maintained with a table cloth so it stays looking new. Her deep gratitude for the support she has received is shown in the way she lives and speaks of what ACAF has done for her and her family. 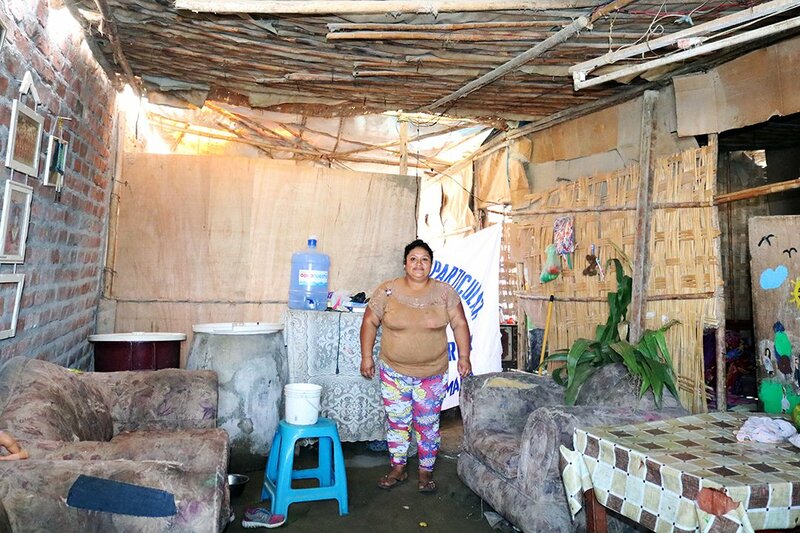 She is extremely appreciative of the donors that make this work possible, improving her life, that of her children and many more people in Nuevo Chimbote. 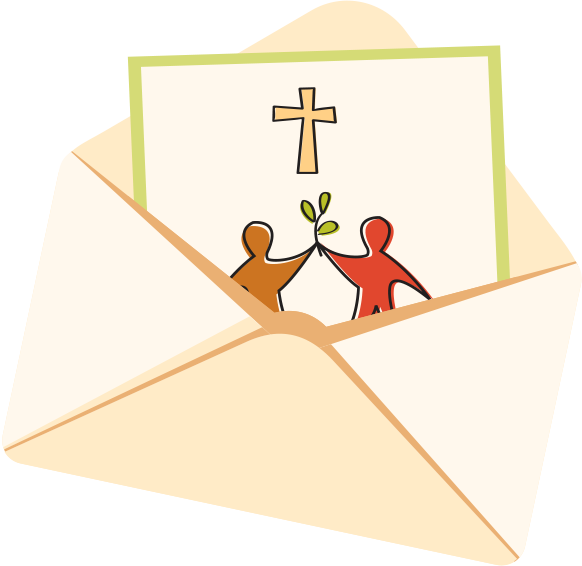 Sign up now to join our circle of friends and receive periodic mission updates via email and newsletters. Join our Circle of Friends and stay up to date on mission happenings.